I'm participating with a bunch of great quilters in a bee/round robin type event called The Traveling Quilts. We started this month. It works like this. 11 quilters, 11 journals, 12 months, and what comes back to me is a finished quilt with my start, the additions of 10 friends and one friend who quilts and binds my quilt before it comes back to me. How great is that! Monica, aka Happy Zombie, made us each our own personalized button for the group. This is part of the start for my quilt that I sent to Faith. I didn't get pictures of the final set! Dang camera batteries! 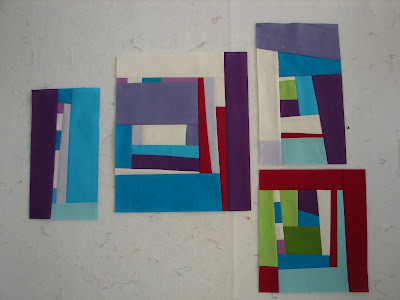 The only caveat for my quilt is color...I want all the colors of the rainbow in this quilt. 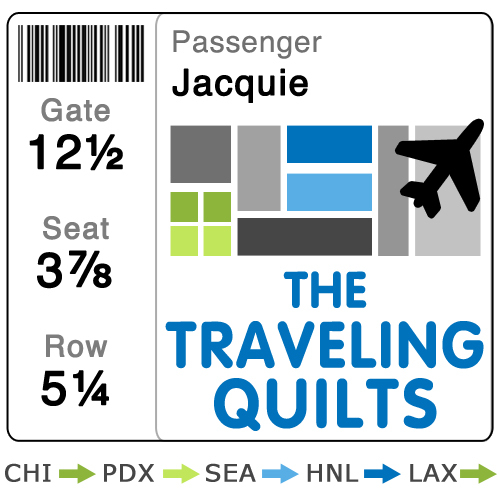 We only get to see sneak peaks along the way, so it'll be a year before I get to see what happens to these pieces and read the journal that documents the journey of this quilt. Wish it was for me :) I love the block on the bottom right corner - yummmy colours!! What a great idea! That is so exciting to find out what the quilt looks like at the end. It's worth the wait! this is the best idea!! I look forward to seeing everyone's quilts at the end of the year! Ooh I see a book in the making! Best of luck and have lots of fun! What fun! I did a similar row robin once and it was a wonderful creative challenge. There were six of us and we didn't get to see what everyone did for our own quilts, but we got to see everyone else's quilt. Love the whole thing! Don't even know what the whole thing is yet... but looks good! it is going to be fun to see this one grow! How exiting, Jaquie! Love your start - that purple really plays well in those blocks! I love this idea! Sounds like great fun. Look at that purple in there...wonderful. I love it! I can't wait to see what your group comes up with! What an interesting idea! Have fun with it.